Given the header to this post, you can imagine where this is going. The day, however, began much more benign than it would end. Being under the weather, I left Friday to get out to western Iowa so I wouldn’t have to get up early and make a marathon run. This allowed me to get up at a leisurely time and be rested for the day. I spent the night in Atlantic, Iowa. Saturday morning, I awoke and visited some relatives (I’m originally from there) and as the day wore on, it started to become clear that I was going to want to head west a bit, but stay on the Iowa side of the Missouri. Eventually, I made the decision to head west towards Council Bluffs and see if anyone else was hanging out in the area. As I approached the city, I noticed a few familiar faces adorning the Spotter Network hanging about. I pulled off into town and tracked down Robert Hurkes and his chase partner James Seitz holding up at a bank. With them was Guy Rhinehart, Tim Thomas and photographer Allison Marshall. After a short while hanging out in the 85 degree sun, joining us was Skip Talbot, Mike Boik, Jennifer Brindley shortly followed by Jesse Risley, Brad Goddard and Jodi Irvin. 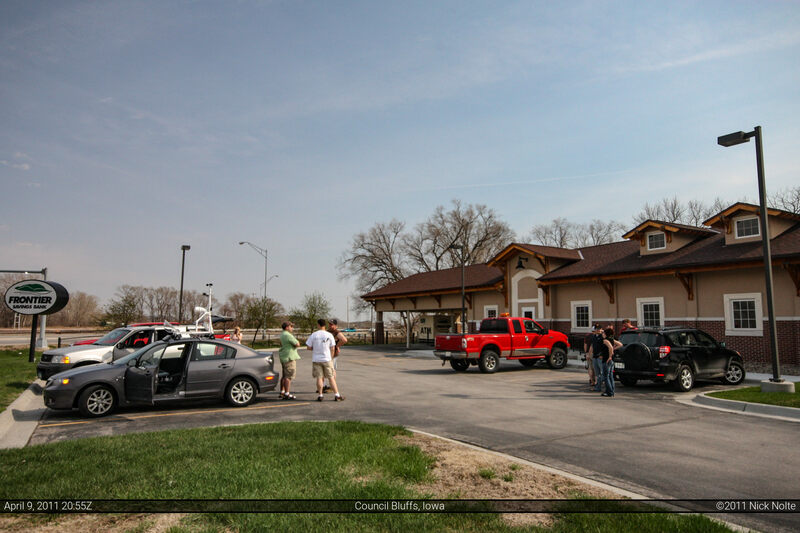 A regular chaser convergence at the Frontier Savings Bank in Council Bluffs. Eventually we all decided to hit I-29 and move north to Missouri Valley. It had appeared that the parameters were better further north, and the cap was more likely to break up that way. We took refuge at the Cornstalk Cafe travel stop where we ran into even more chasers. Not long after our arrival, on the horizon to the west we could see a storm a brewin’. Radar indicated the storm was moving almost due north which made a lot of us hesitant to chase it as it could cross the warm front into the stable air. However, after watching for a bit it was pretty much the only game in town, so just about everyone hit the highway and started north. What ended up happening, is the storm split several times and eventually a dominant right moving supercell, severe warned, tracked across the Missouri River into Iowa. That’s when things started to get interesting. As the cell started to move nearly due east it started kicking up gustnadoes. Others have wondered if these were tornadoes, or some other strange interaction with the RFD and other features. They would be one of the stories of the day as our chase group saw similar features several times. I left the Cornstalk Cafe almost after everyone else and caught back up to Rob, James, Tim, Guy and Allison somewhere on highway 175 east of Onawa. We watched the storm for a little bit and decided to keep on 175 towards Mapleton. Ahead of the storm, we entered town, driving through the very same area that in just ten minutes was going to get destroyed. Shortly after entering town is when the hook echo appeared on radar and the tornado warning was issued. Being ahead of the storm, we promptly turned around and headed back out of town on 175 to intercept. 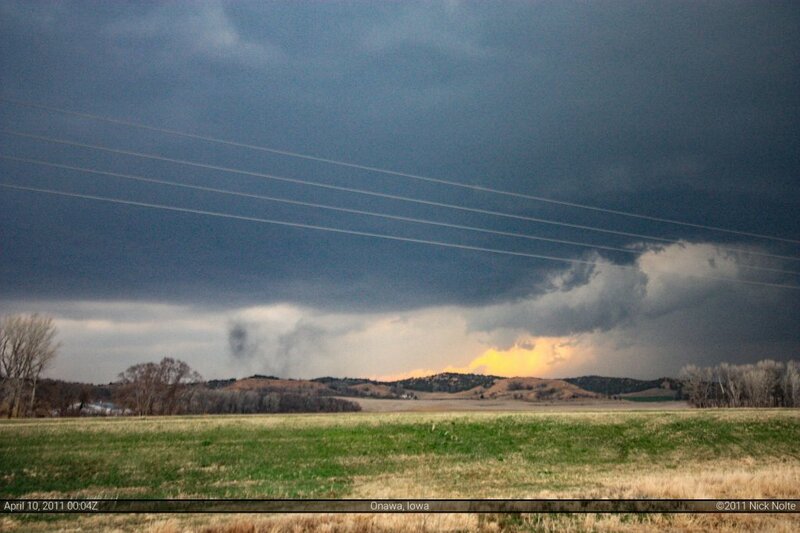 As we stood there in 40mph inflow, we witnessed two gustnado like features atop the hill. Eventually the storm moved off towards Mapleton and we tracked it as darkness began to fall on the day. As we approached town again on 175, that is when the storm dropped what would become the Mapleton EF-3. This is the only still photo I have of the tornado as it ran nearly parallel with the highway. As the tornado trundled towards town, we kept right behind it on 175 and got within 1/2 mile when we stopped to observe near a bridge just shy of Poplar Avenue. My mobile mesonet record a 79 mph wind gust out of the NNE at this point as well as recording a 4 mb drop in pressure over 30 seconds. This is when the tornado was at its strongest and it was moving into the southwest part of Mapleton. The video below encompasses everything up to this point. After the tornado pulled away further into town we headed in and that is when it became painfully obvious that Mapleton had taken a direct hit. The first buildings we could see along 1st Street were demolished. We turned south onto the first road to begin helping anyone we could, but the strong smell of gas and downed powerlines prompted us to reverse course and get back on the main road. We had driven through town and it was clear the devastation was wide spread. Shortly after exiting town, we all pulled off the side of the road and decided the best thing to do was to go back and help out in any way we could. It was becoming dark, the storm was pulling away and this town had just been hit. There wasn’t another choice to make. We went back and parked at the corner of 5th and Courtright and started to look around for anyone needing help. The house across the street had been hit hard but was still standing. The house immediately to it’s west was completely leveled. Power poles stood against the black sky with no wires between them, ripped from their mounts and deposited elsewhere. It was at this point, looking north towards Main St, that it dawned on me, this was the town we had just passed through prior to the tornado. Just twenty minutes earlier I had driven through this town and saw it with my own eyes as it had appeared the day before. In that short period of time the lives of so many people were changed, I was in the middle of it and being my first experience with a ravaged town was unsure how to react. I stood at the corner of 5th and Courtright looking around imagining what I would feel if this had been my home. The roof of a garage was completely removed from it’s frame and deposited in the neighboring lot, a boat stored inside, exposed to the elements had seemed to weather the damage quite well. Walking down an alley, twisted metal, branches, shingles, siding, garbage everywhere. A red car had it’s driver’s side window smashed, no one was inside. Residents walking amongst the rubble, most seemed silent and stunned at what had just transpired. “You guys OK?” we ask. They nod without speaking a word. The area we had walked around no one really needed help, several minutes had passed and law enforcement was showing up, their flashing lights providing the only illumination in the darkened town. A woman pulls up near us in her car and walks over to the white house in the photo above and enters. It was her house and she had just got home. She later appeared at the door, phone in hand calling relatives letting them know what had happened and that she was ok.
Local firefighters and EMT were now crawling all over town and also going door to door. 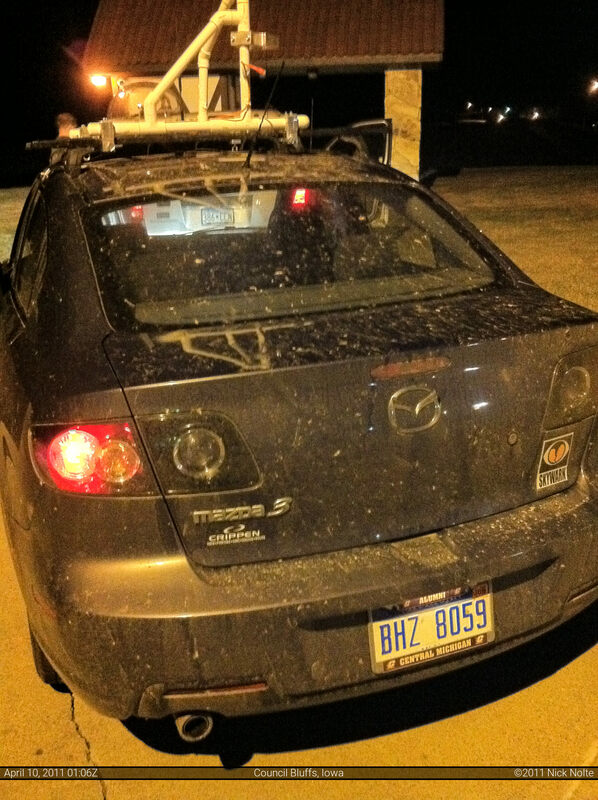 One asked if we were OK, we told them we were storm chasers who had pulled off to help after the tornado hit. He said if we found anyone that needed assistance to let them know. A man to our west revved up a chain saw and went to work on a large tree felled across an intersection. After a while, we all met up again and decided that things were relatively under control in town and there was nothing more we could do. Local law enforcement was asking anyone not a resident to leave, so we left. We headed towards Ida Grove to find something to eat and recollect what had happened this day in Western Iowa. Mixed feelings abound as a successful chase abruptly turned into a disaster scene. We had intercepted the tornado, but it left unimaginable damage in it’s path. For the immediate time afterwards, I was having a difficult time reconciling the two feelings. 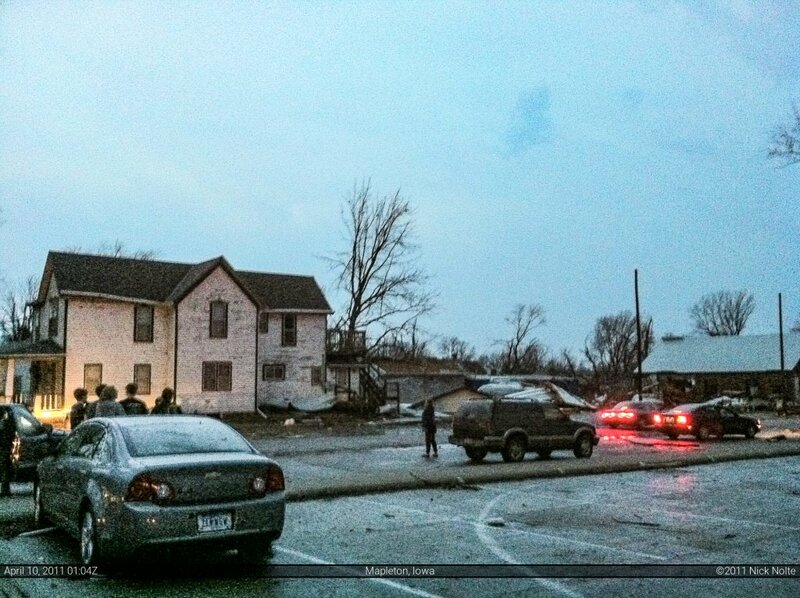 Later we found out they had given the tornado a preliminary rating of EF-3 and that there were no fatalities to report. Only a handful of injuries, the worst of which was a broken leg. That news was amazing, and a bit relieving. A small town had just taken a direct hit from a 3/4 mile wide tornado and the worst to report is a broken leg? Unbelievable. 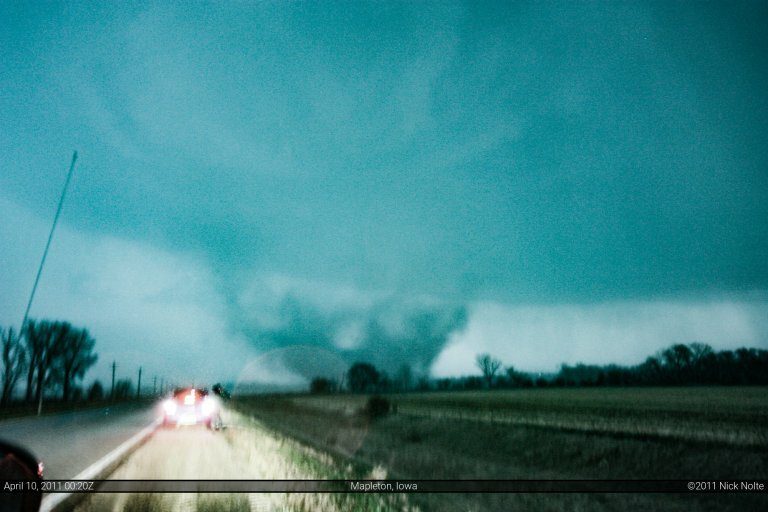 While chasing storms and capturing that tornado on film can be a rewarding experience, there is a human element to take into account. These storms move across the land without regard to things or people in their paths. Most of the time towns and cities are spared by the destructive wrath these storms can unleash. 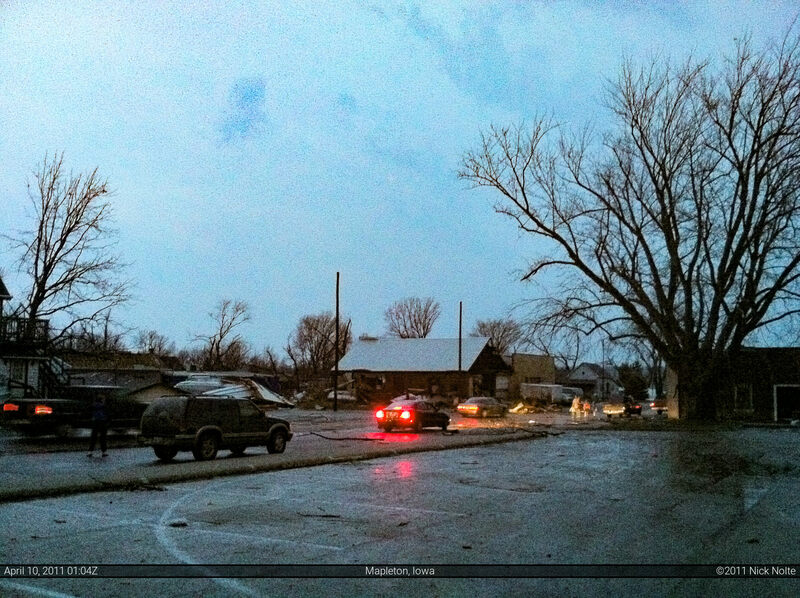 This one night, in Western Iowa, Mapleton was not spared, but every single resident within it’s boundaries were. And that makes the story that much more incredible.